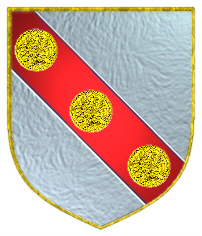 Coat of Arms: Silver on a red bend three bezants. 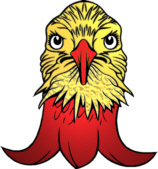 Crest: An eagle's head divided per fess gold and red with a red beak. Motto: Pro Deo et ecclesia. Motto Translated: For God and the Church. English: from Middle English biscop, Old English bisc(e)op ‘bishop’, which comes via Latin from Greek episkopos ‘overseer’. The Greek word was adopted early in the Christian era as a title for an overseer of a local community of Christians, and has yielded cognates in every European language: French évêque, Italian vescovo, Spanish obispo, Russian yepiskop, German Bischof, etc. The English surname has probably absorbed at least some of these continental European cognates. 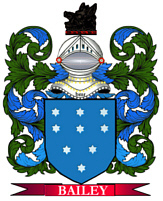 The word came to be applied as a surname for a variety of reasons, among them service in the household of a bishop, supposed resemblance in bearing or appearance to a bishop, and selection as the ‘boy bishop’ on St. Nicholas’s Day. Spelling variations include: Bishop, Bisshop, Bisshope, Bishope, Bishoppe and many more. First found in Worcestershire, where they held a family seat from ancient times, long before the Norman Conquest in 1066. Some of the first settlers of this name or some of its variants were: Daniel Bishop who settled in Virginia in 1663; Henry Bishop settled in Maryland in 1633; Joseph Bishop in Virginia in 1644; Thomas Bishop settled in the Barbados with his wife and servants in 1680.